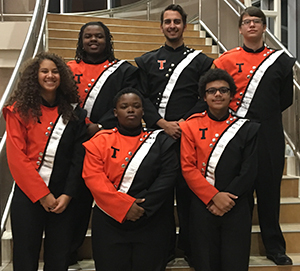 Texarkana, TX – Six Texas High School band students were selected to the Texas Music Educators Association Region IV All-Region Jazz Honor Band during auditions held recently. Selected students are: Craig Crawford, Kyasia Hawkins, Michael Markham, Jalena McDermott, AJ Reed and Marquez Roach. Students participated in an All-Region Jazz Concert in early December at Paris Junior High School.